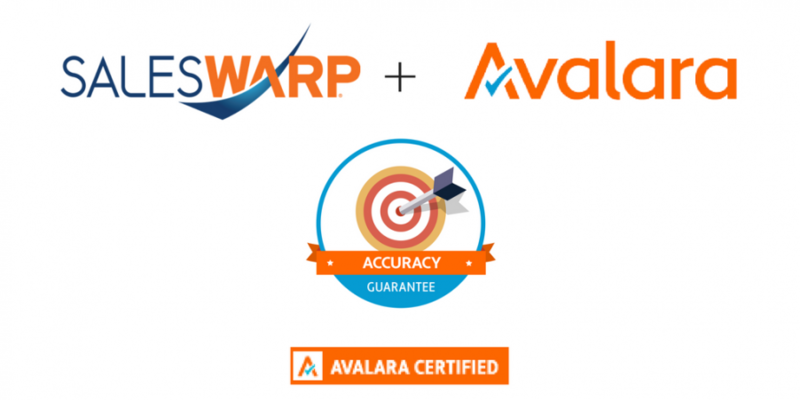 The SalesWarp team is excited to announce our official, certified integration with Avalara. Avalara provides cloud-based sales tax compliant services that are fast, easy, and affordable to businesses of all sizes. The SalesWarp / Avalara partnership provides a completely integrated order and sales management solution that is completely tax compliant. This integrated solution allows retailers to focus on efficiently running their business, rather than spending time on complicated and time-consuming tax research. Tax laws are very complex and are changing constantly. Researching and applying tax rates is extremely complicated and must be done continually to ensure compliance. For a business processing thousands of orders per day, this is almost impossible. Additionally, tax laws differ across various states and can vary depending on the products being sold. Thus, ecommerce retailers who are selling various products nation-wide and internationally, face an even more daunting and exponentially harder task. Avalara provides cloud-based geolocation technology to ensure accurate tax rates across more than 12,000 jurisdictions. This solution saves time by reducing tedious tasks like data entry, address verification, tax rate research, tax filing, and various other manual tasks. Avalara provides accurate and automated tax calculations for every transaction in real-time. SalesWarp provides retailers with a powerful cloud-based omnichannel order management software that automates complex, time-consuming management tasks across every online and in-store sales channel. SalesWarp automates the entire order process, from the time the order is received to when it’s delivered, ultimately eliminating errors, increasing efficiency, and reducing operational costs. Retailers using SalesWarp can now instantly add the power of Avalara to accurately manage your transactional tax compliance in a seamless way. With this certified integration, SalesWarp clients have the ability to automate yet another key component in the order management process, from SalesWarp’s cloud-based platform. Merchants can be confident that accurate calculations are automatically applied in real-time to invoices, including new and updated quotes, sales orders, and returned orders. This automated calculation reduces tax reporting and collection errors and saves retailers a significant amount of time. With that additional time, they can focus on improving other areas of their business. When combined with SalesWarp, retailers will also be able to expedite the order fulfillment and returns process, which ultimately improves the customer experience. Finally, SalesWarp’s and Avalara’s integration with QuickBooks allows sales tax and transactions to be recorded seamlessly. If you’re using SalesWarp, it’s easy to automate your order processes and sales tax compliance using Avalara. Schedule a call with a SalesWarp consultant to learn more about this robust sales tax automation tool.